Designed for safe transport to and from the shower . Anodized, non-corrosive aluminum frame construction will not rust . Comfortable nylon backrest removes for easy cleaning . Cushioned armrests enhance user comfort . 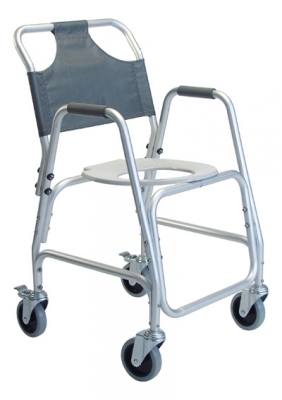 5" swivel casters with rear wheel safety locks facilitate maneuverability in tight spaces . Rolls easily over most toilets . Allows complete access to body for easy cleaning during bathing . Maximum Weight Capacity 250 lb - EVENLY DISTRIBUTED . Limited lifetime warranty . 30" x 23" x 22"